Oil paint tubes get cranky as they get older. The thread gets gunged up with oil paint and the lid no longer wants to screw on tightly. No amount of cleaning or care can prevent the lid of the tube from getting temperamental with overuse. Eventually, the seal becomes compromised and a skin of dried oil paint develops within the spout of the tube. The next time the artist attempts to squeeze the paint from the tube, it resists before spurting out in one go. The result is a huge blob of oil paint on the palette that was not intended. This causes waste of oil paint and frustration, as the pigment cannot go back into the tube. 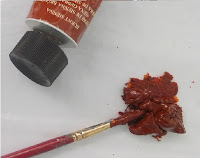 As with me, a tube of burnt sienna developed a wonky lid, no matter how I tried to screw it on squarely. A little air had got into the tube over time, causing a skin to form within the lid. With little pressure, the paint came out in one go, which was rather annoying. No one wants to waste costly oil paint. But there are ways of salvaging the oil paint for another painting. Don’t despair. The oil paint can be salvaged. Remember that oil paint dries quite slowly and does so by oxidization. This means providing an airtight container where the paint is in no contact from the air. Of course, the tube is no longer an option. 1 Scrape the paint from the palette and into a little tin foil measuring a few inches square. 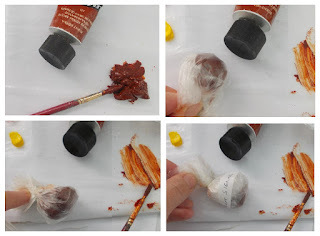 2 carefully parcel up the paint within the tin foil, allowing no air to remain within. 3 To ensure an airtight seal, wrap the tin foil parcel within a layer or two of tough clingfilm. Check there are no tears or holes where air can get in. If no tin foil is at hand, two or three layers of clingfilm or similar plastic should do the trick, as I did here. Don’t use plastics or tin foil with print or dyes, or it could leach onto the pigment. 4 Seal the parcel tight with a twist of a food tag at the top. 5 Label the parcel with the pigment that is within. The paint should remain fresh and useable for the next painting. I have yet to test out how long the paint will last, but I have kept the parcel for a month and the pigment within remains as fresh as from the day I had first squeezed it onto the palette. An oil paint lid that refuses to screw onto the tube will cause the paint within to dry out. To prevent this from happening, place clingfilm over the top of the tube. This is not ideal and care is needed not to get paint elsewhere when opening the tube, but is preferable to wasting lots of oil paint. I keep temperamental oil paint tubes in a separate container wrapped in rags, so that the other tubes are kept clean. The artist’s box of tricks might not appear aesthetically pleasing as of the day the tubes of oil paints have been purchased, but it is the paint applied onto the canvas that matters, not the appearance of the artist’s materials. I prefer to see well-used art materials to the pristine unused sort that languishes within a forgotten cupboard. You can also use 1st Art Gallery to fill in a seasoned collector with reproductions that look as fine as their highly valued original pieces. You can use our services for both residential and contract projects, and the quality of both our paintings and our customer service will never disappoint you.